CNN – the news network that is dubbed “fake news” by President Trump – attacked a Republican congressman who called for a federal investigation of the unsolved murder of DNC staffer Seth Rich and any possible role he may have had in the leaking of Democratic National Committee emails during the 2016 election. 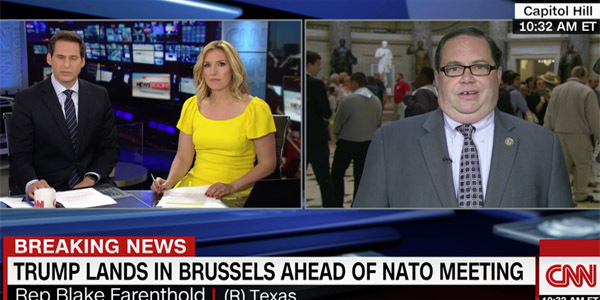 CNN reporters quickly cut the congressman off. “I’m sorry, I’m sorry, the ‘insider job’ – what are you referring to here?” asked CNN’s John Berman. “There’s stuff circulating on the Internet. My question is, why …” the congressman continued, but he was again cut off by Berman. “What’s circulating on the Internet that you think is worthy of a congressional investigation? Because the D.C. police are investigating this, and so far they haven’t said there’s anything there” to suggest any DNC-link to Rich’s murder, Berman demanded. The fourth-term congressman noted that the DNC denied the FBI’s “multiple requests” to examine the hacked computers. Instead, the DNC hired a third party organization, CrowdStrike, to perform an analysis.